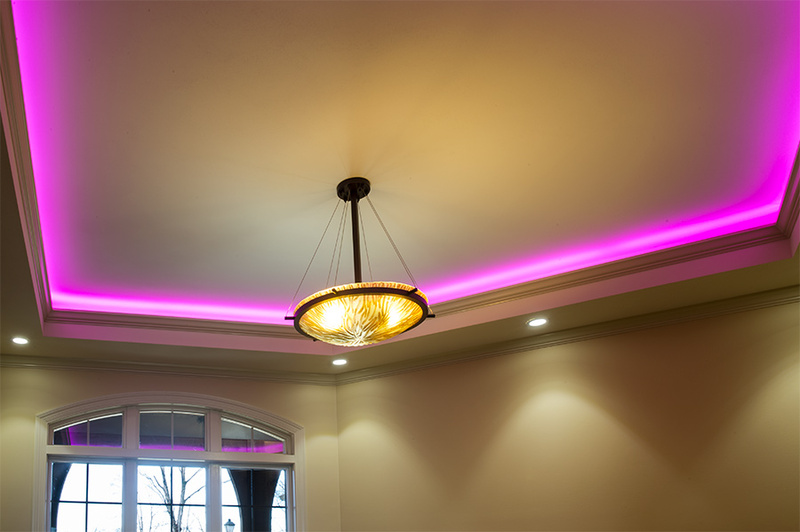 Universal Waterproof RGB LED Light Strip Kits - LED Tape Light with  SMDs/ft.,  Chip White SMD LED : Shown On In Magenta, Cyan, Green, Yellow, Blue, Red, Warm White, Cool White, And Natural White. 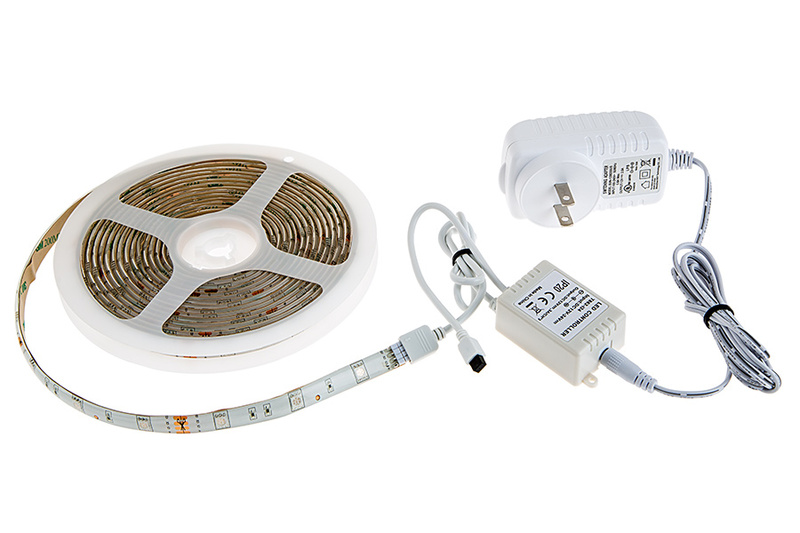 Universal Waterproof RGB LED Light Strip Kits - LED Tape Light with  SMDs/ft.,  Chip White SMD LED: Apply Silicone Sealant (Sold Separately) At All Connection Points To Ensure Weatherproofing. 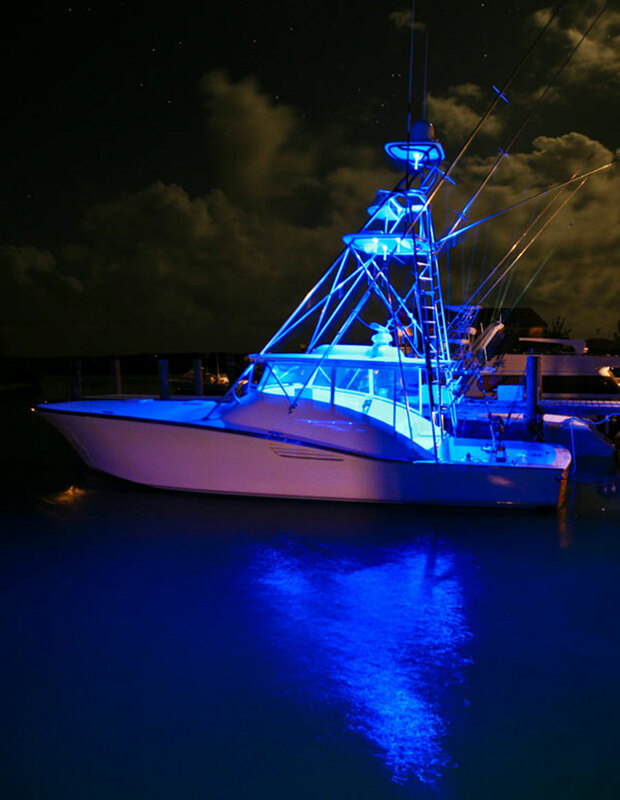 Universal Waterproof RGB LED Light Strip Kits - LED Tape Light with 9 SMDs/ft., 3 Chip RGB SMD LED 5050: Installed On Boat. Universal Waterproof RGB LED Light Strip Kits - LED Tape Light with 9 SMDs/ft., 3 Chip RGB SMD LED 5050: Shown Installed Under Bathroom Sink. 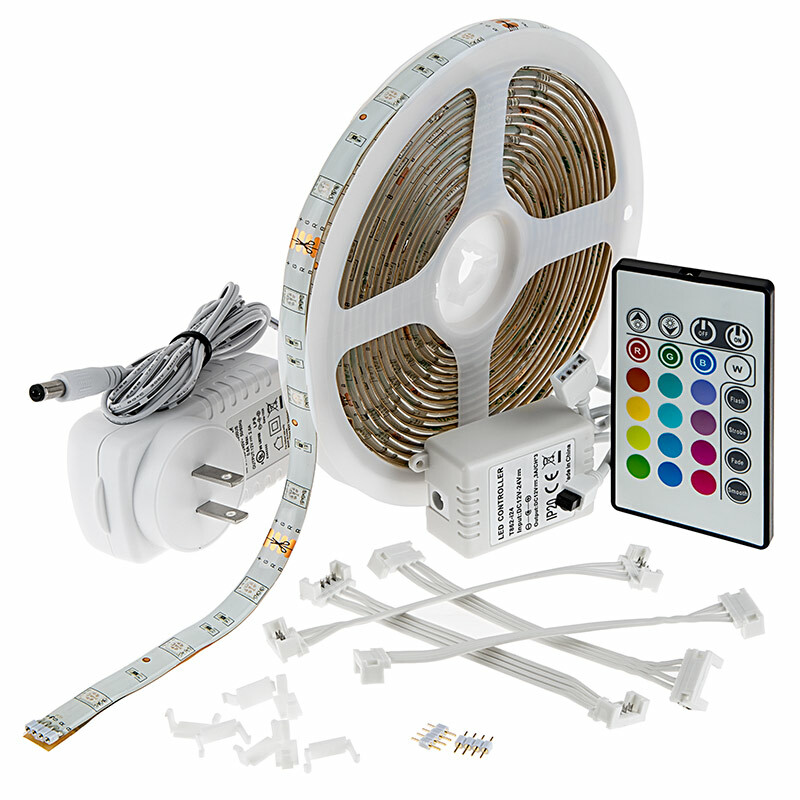 This complete Universal Weatherproof RGB LED Light Strip Kit provides outdoor illumination on decks, patios, gazebos and railings but can also be used indoors. 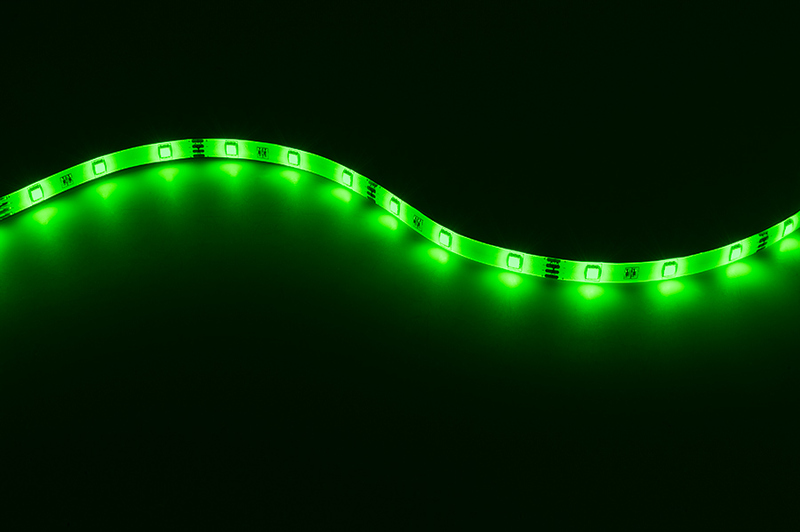 The flexible 16-1/2' strip has 150 RGB LEDs (5050 SMD) with an output of 552 lumens. 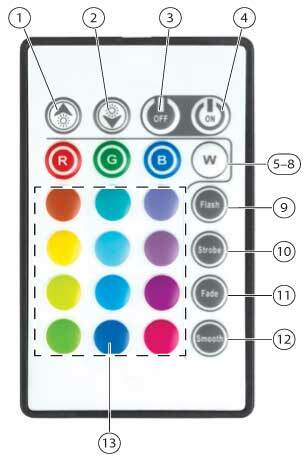 Colors and color modes (flash, strobe, fade and smooth) are adjustable with the hand-held IR remote. 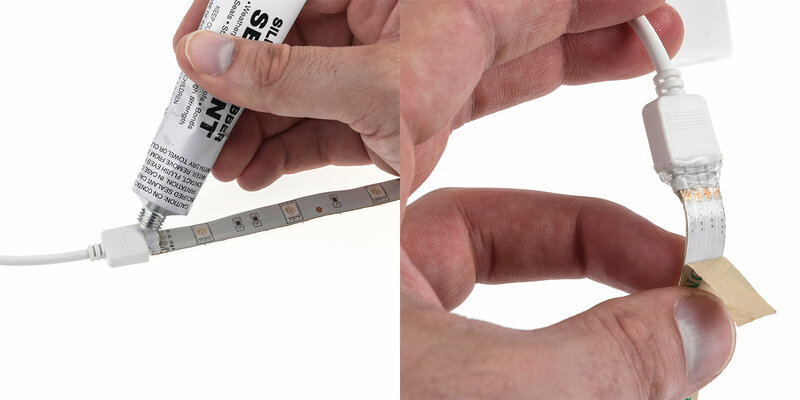 The plug-and-play strip light uses a standard two-prong outlet and installs easily with a peel-and-stick adhesive backing. 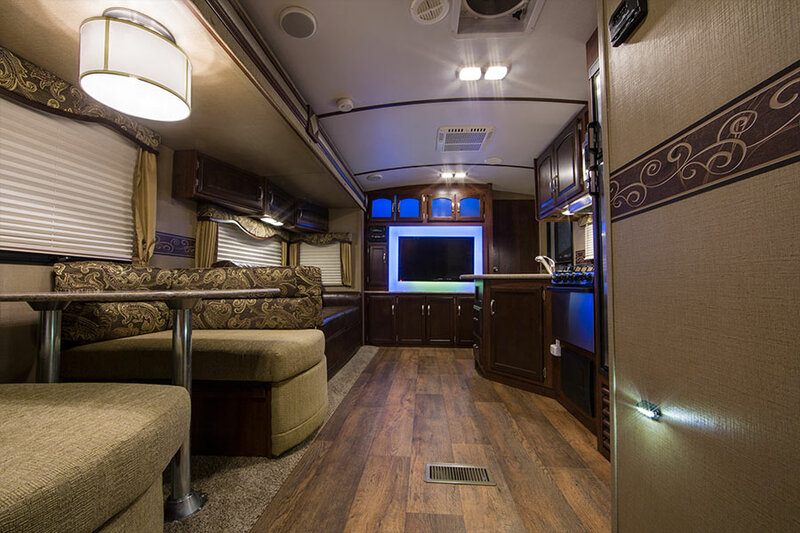 The silicone-encased strip is weatherproof for year-round outdoor use and is designed to last 50,000 hours. It operates within a 12-14.5V DC range and can be cut into 3-LED segments. 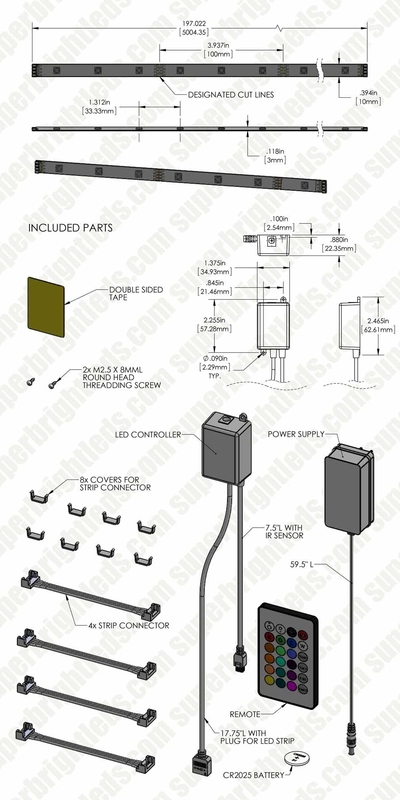 The kit includes 1 RGB LED light strip, controller with 4 connectors and IR remote, 12V DC power supply and mounting clips. 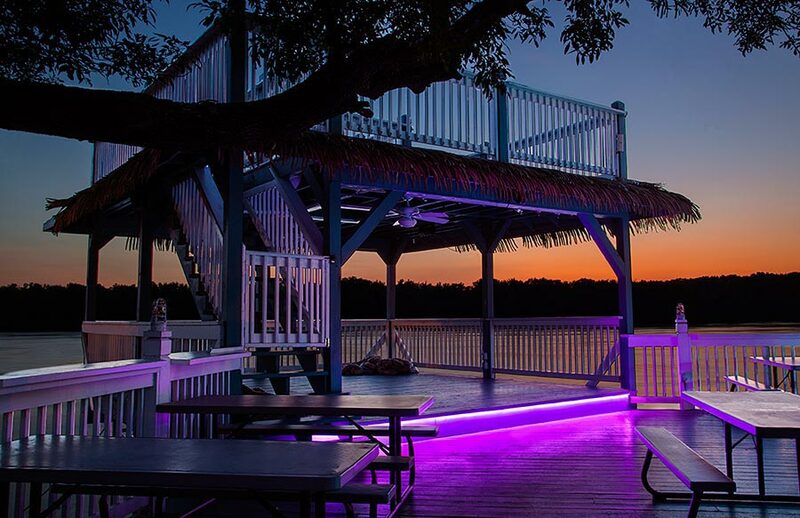 The included remote is perfect for operating this weatherproof single color LED strip kit and has a maximum range of 30 feet. Maintain line of sight between the remote and the controller's IR sensor. WFLSK-RGB150-IR - Outdoor RGB LED Strip Light Kit - Weatherproof 12V LED Tape Light - 34 Lumens/ft. These lights are much more than I was expecting. We were able to buy two strands and splice them together with not one issue at all. 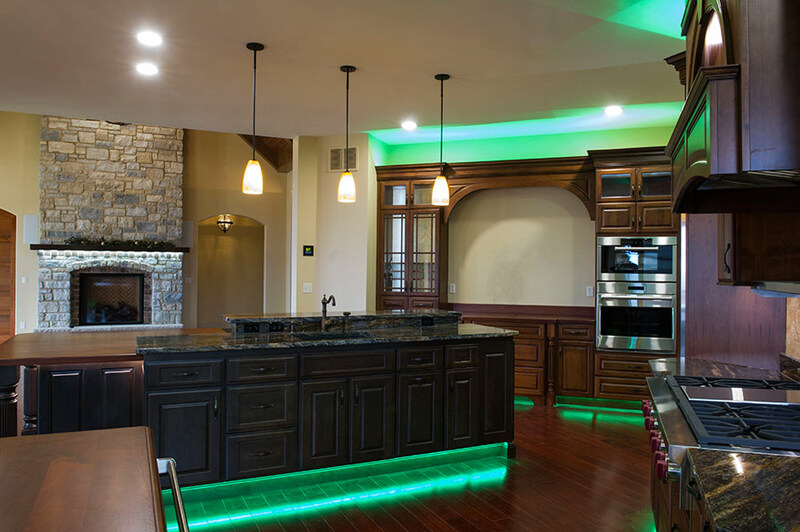 They were so easy to install and I Love the remote control for the lights. Just one thing I wish they did and that is I wish the white was not a soft white. I was hoping for a bright white or the ability make them whiter. They are more of a soft blue to to me. These kits are set up to power and control one 5 meter reel of LEDs. We do not recommend splicing together additional strips. 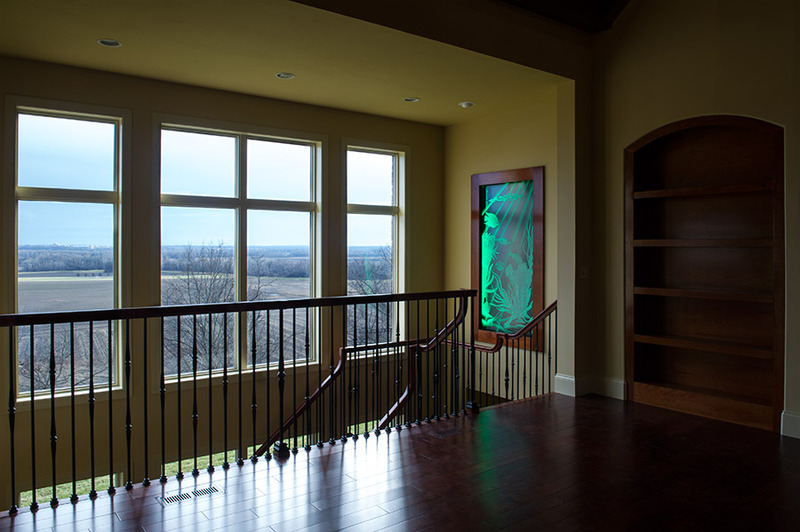 The product performed as specified and gave us the opportunity to showcase our glass, cabinet skills, and having the product in hand on short order allowed us to be timely on delivery. 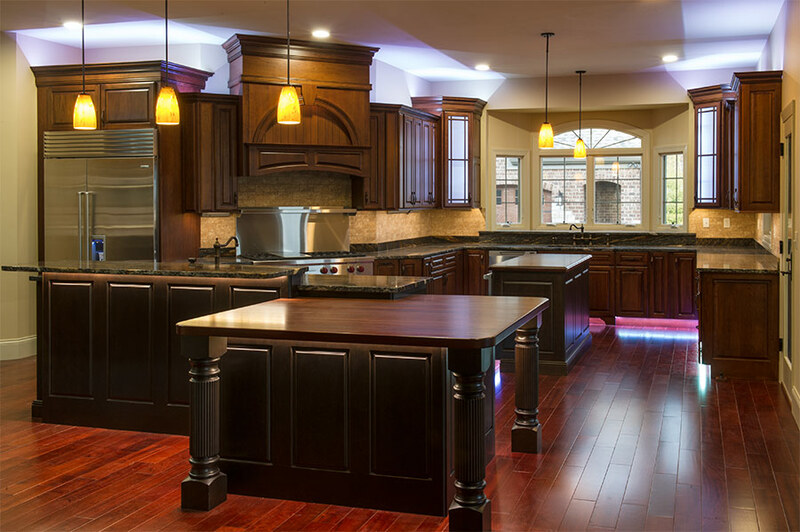 I wont look anywhere else for LED product. You guys have served us well repeatedly with product, technical knowledge, and service after the sale. Thank you so much! I changed out white LED's for this multi color product. It really made a difference. 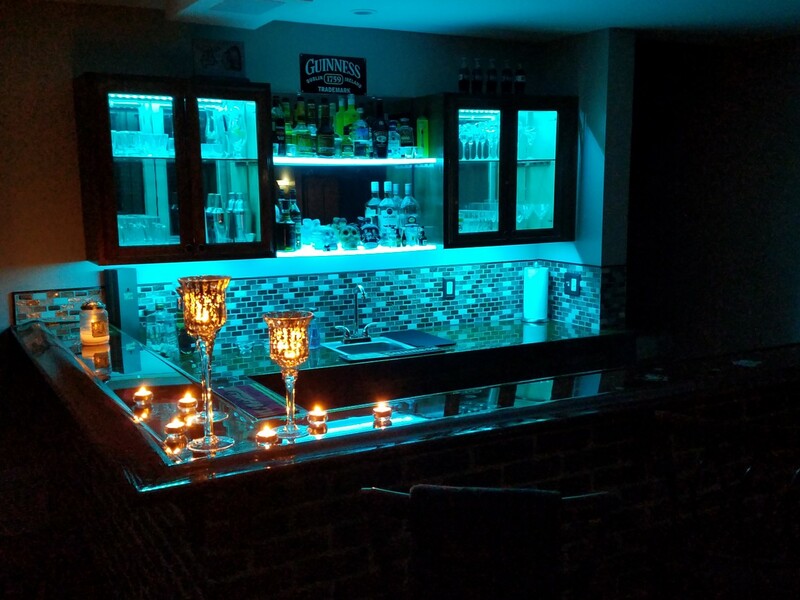 It looks great with my LED liquor shelves. It was really easy to install. 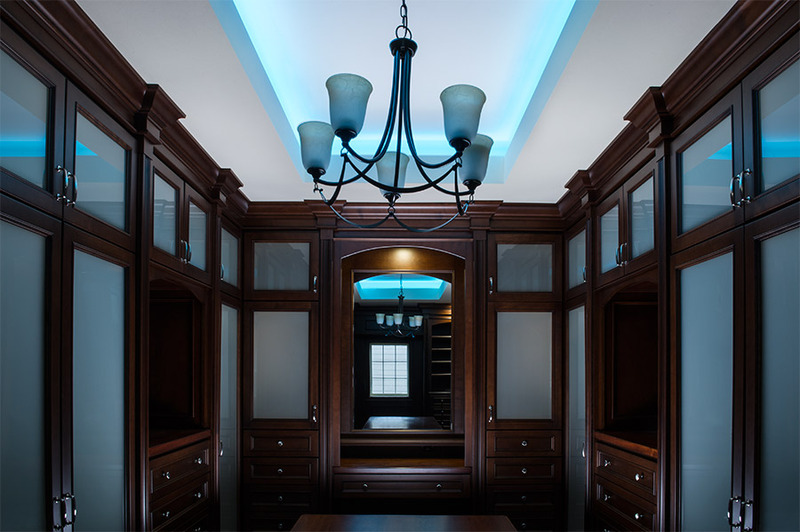 This is the second "under cabinet" product I have purchased from superbrightleds. A 5.3 meter long, RGB color changing leds. The kits works as advertised. Runs cool. I use it indoors.